Good morning! 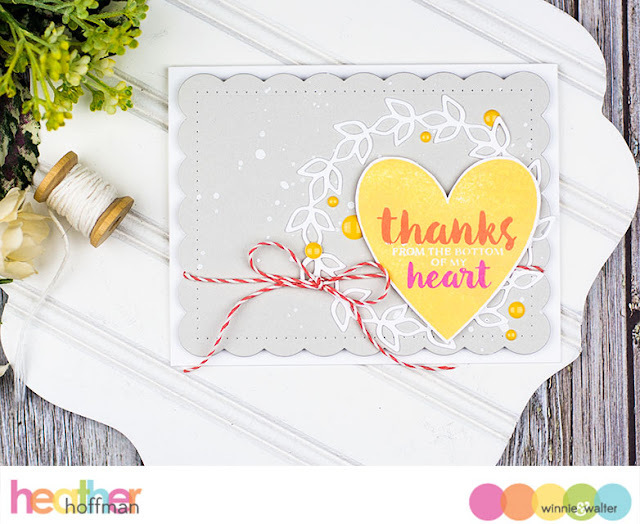 Heather here stopping by this morning to share another card using a color combo from Pinterest and an exciting change to my monthly color posts! Shay and I have been chatting and decided that it would be fun to make this post a challenge as well! So - if you feel inspired to play along, one lucky winner will receive a $25 gift certificate to Winnie and Walter! YAY! 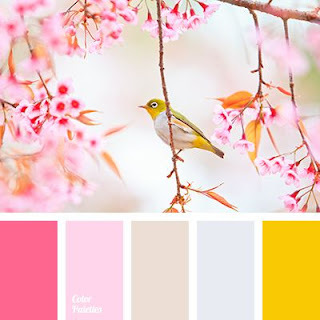 And here is our color combo for this month - I hope I'm not the only person longing for spring! Haha! For my card I used the set that was the new free with purchase set from the last release - don't worry though, I happen to know it will be available for purchase with the next release as well! I also used Essentials: Noelle Cutaways for my base, and In Bloom: Paulina's Greenery Cutaways for the wreath. A splatter of white paint, some enamel dots, and some twine finish off my card. New challenge will post on the second Monday of each Month, and will end on the Friday before the next challenge begins to allow time to pick a winner and some favorite entries to feature. Create a new project using the March Color Combo. Use at least one (1) winnie & walter product. This can include Cutaways (dies), Creative Screenings (stencils/masks), printable/digital items, cut files and/or stamp sets. Remember we offer freebies in our shop. Our freebies can be used to create your project(s) for this challenge. Link up your project below using the InLinkz Link-up by 11:55 p.m. CST on Friday, April 7, 2017. This March Color Combo Challenge may be combined with other challenges found here on the w&w blog or elsewhere. One randomly selected entry will receive a $25 gift certificate to Winnie and Walter. YAY!!! I can't wait to see your entries! Beautiful card :) love the colors in the mood board. What a beautiful choice for the inspiration photo and color palette!! And....what a pretty springy card you made. I love the effect of the white wreath behind the heart. The pale background hues really make the pink and goldenrod pop. Also....VERY excited that your feature now will include a challenge, too! A big thank you to Shay for her generosity!! I feel a little embarrassed that I am blitzing this challenge with so many cards, but I just had sooooooooooo much fun with these colors!! 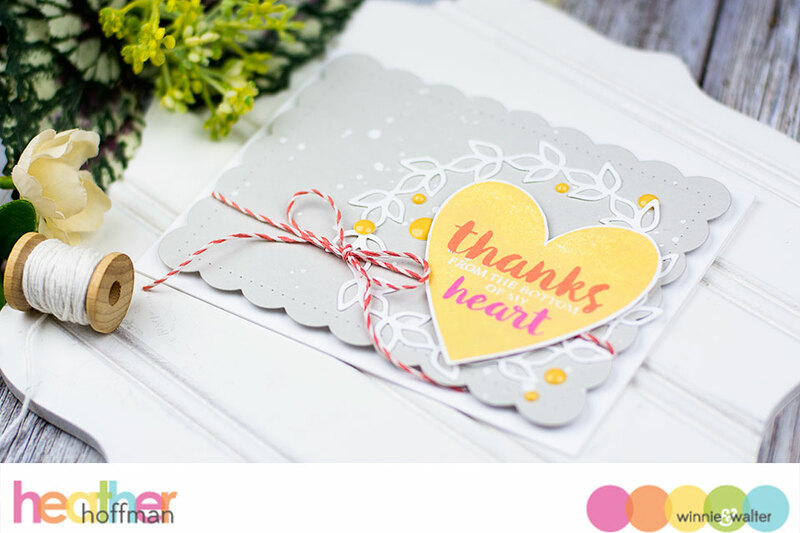 Also, I find that the W&W Essentials series of Cutaways coordinate so perfectly with other images and sentiments that I use them on almost EVERY CARD I MAKE!!! Love love love!! Thank you again for this challenge!! This is going to be so much fun. Love the colors you choose and a big thank you to Shay for her support. Wonderful card too, Heather. I can't wait to join in. Wow!! lovely mood board..Love your card Heather..
LOVE the combo of colors and your fresh springtime design. The mix of colors in your sentiment makes this sweet card even more adorable. The mood board and your card are putting me in Spring mode, even though it's raining here in Greece. Yay for another fun challenge! Great colours and inspiration image...Spring is here! Your card is so sweet & modern--beautiful! Hope to play along--not a color combo I would usually incorporate, so will be a good challenge for me! Wow!! Can't wait to play. Was wondering if the winners of the 3rd birthday bash have been posted? If so, where? I see Janis aims to win, but I'm still hoping to finish up my one card & play along. Just stopped by to admire your card once again, Heather, & tell you the cherry trees on our street are about to bloom--Happy Spring!